One major issue with high-rise buildings is how much direct sunlight falls directly on them, and this is very bad news for windows. The Sun turns the glass panes yellow and discolours the frame, which makes any building worn out and unpleasant to look at. No matter how new are the other parts of the building, windows are at the forefront and it is what people notice immediately. If you want your building to be attractive, you must ensure the windows are in tip-top shape. That’s where our company comes in! 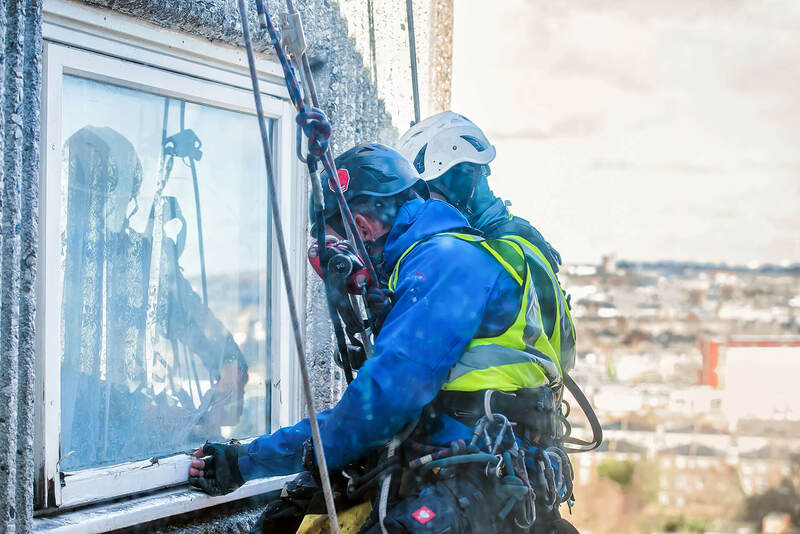 Whether you are a construction company looking to renovate the windows of a tall building or a single home-owner, our abseiling technique is the fastest and the most cost-effective solution on the market. We have a team of more than 50 specialists that can take on any task no matter how large. Thanks to abseiling, we don’t need any kind of special government permit to work on a building, so if you are in a hurry and want to finish a project fast, contacting us. Our company will be your best course of action. We’ll come in, perform our work, and finish faster than any competition. Our satisfied customers include some of the biggest construction companies in London, so you can be sure of the quality of service we provide.